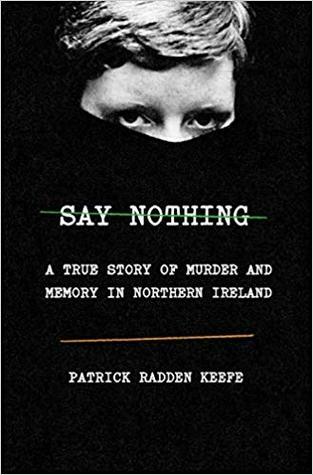 SAY NOTHING: A True Story of Murder and Memory in Northern Ireland by Patrick Radden Keefe – Books, Books and More Books! The horrific conflict known as The Troubles is introduced to us beginning in 1972, when Jean McConville, 38 and a mother of ten children was abducted from her home in front of her children and neighbors, never to be seen again, until years later when bones found on a beach turned out to be hers. Everyone knew it was the IRA, but no one was speaking out. Fear and Paranoia were rampant and no one was safe. Family members turned on each other. Neighbors turned a blind eye and some, like Dolours Price, were carrying on the family tradition of violence and proud of it. This was a bitter conflict that I once thought was over Catholic vs. Protestants but that was only a small part of the story. Everyone wanted peace, but when it came, it was shaky at best. This is one of the best books I have read on the Irish Conflicts. Turning loved ones against each other and so many deaths and in the end, who was right? Was it all worth it? I don’t know but reading this account I fully intend to find out more. When I went to Ireland last fall, I visited the Peace Walls and did a Black Cab tour. I also thought it was about religion. That was just the tip of the iceberg. I will have to see if i can find this book. Wonderful review. Thank you. My Grandfather told us a lot about those times but I’m still intrigued.